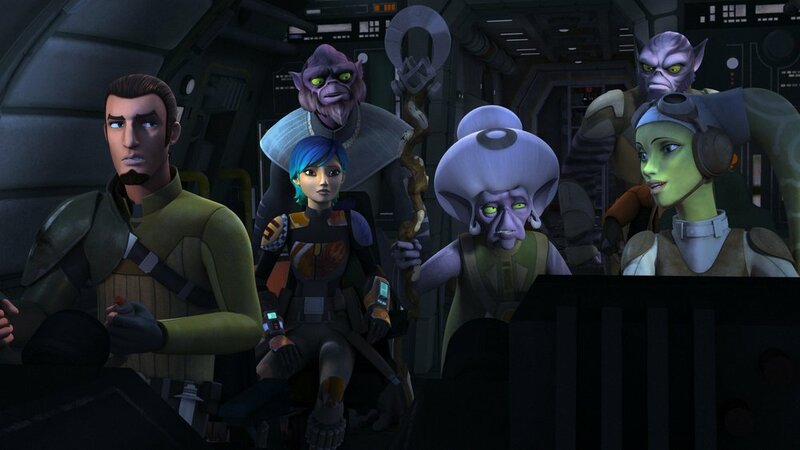 Legends of Lasat When fan favorite Hondo gives Ezra intel on some Imperial prisoners the crew of the Ghost are shocked to find two Lasat. Zeb, who thought that he was the last of his species, realizes that he might be the key to a prophesy that helps his people find a new world to inhabit. Hondo. Hondo is, as always, a funny and delightful character. Throughout the episode we get to see the space pirate navigate and manipulate his way through several sticky situations. I am happy that he has been included in the Rebels series. Zeb’s backstory is also something that I enjoyed and it seemed to work well. Like Sabine last week, we are treated this week to a little more of the backstory of another member of the crew of the Ghost. Ezra and Zeb have a lovely scene where Zeb opens up about what had happened to his people and his role in those events. It gives some much needed depth to Zeb, who (you could argue) at this point has been the strong guy, that occasionally provided comic relief. Out of everything though it is the music that stands out the most. The last 7-8 minutes provides some of the best music I have heard on Rebels so far. It is memorable and not like anything I have heard on the show this season. I loved it. When you watch or re-watch the episode, pay attention to it. Hey, guess what? Agent Kallus failed again. I like this character so much and I loved his iteration in the first season. But all this guy does is fail. I hope the upcoming episode with Kallus and Zeb works to restore the believability in this character. Right now he is a stock villain that simply turns up to fail and provide a weak foil for the crew of the Ghost. For me the show still feels like it is setting up something. How long does a setup need to take? You could exchange “setup” for a worse term... “filler”... but it may apply. Overall, this episode has some great things going for it, but it still makes me feel like I am waiting for something much bigger and better.